Today’s blog has the pleasure to introduce Heather, Seagate’s next generation. Some of the key people working their way up the Seagate company ladder include family. Heather grew up in the family business, and has been working in the company for most of the last 7 years, with one time-out for a solo back-packing trip through India. Many of our health food store customers by now have met Heather, either at trade shows or from her visits to individual stores as she travels around the country doing trainings and store visits. Heather studied art, with a specialty in metal-work and metal sculptures. She maintains a welding shop in San Francisco, where she works nights designing and producing metal sculptures in between road trips for Seagate. Early this Fall, Heather was invited to interview on Doug Kaufmann’s t.v. show “Know the Cause”. Doug maintains his own studio in Rockwall, Texas which is 30 miles northeast of Dallas. Below are two of the 25 different segments that Heather taped in one day. Heather showed great poise, stage presence and ability to handle the technical subject matter and work with Doug and Richard. She was not at all intimidated by the cameras. Seagate has been a sponsor of Doug Kaufmann’s radio and t.v. shows since 1997. It has been a pleasure to grow with Doug as he has spread the word to a national audience. We look forward to having Heather appear more frequently on this show in the future and gain more television experience. Seagate is very fortunate to have a group of talented, hard-working people in the U.S. and Mexico. For the fish picture of the week it is appropriate to feature Heather with a small sea spider. 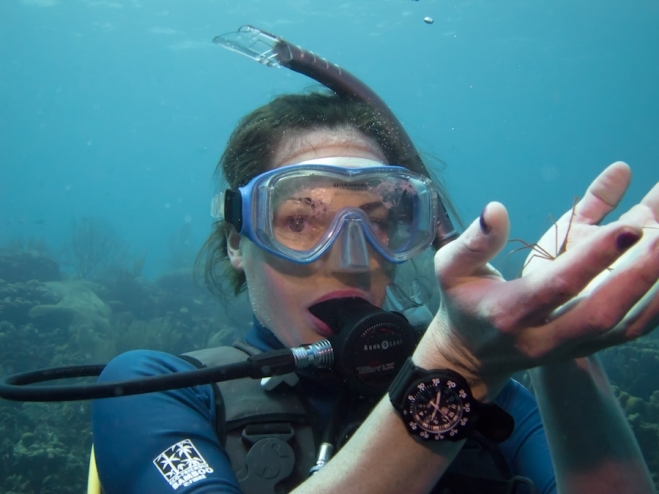 Among her various talents, Heather is a certified diver. She regularly accompanies Richard on his dives and is learning underwater photography.